An armoured Dinosaur as big as a tank that was even a match for Tyrannosaurus Rex has been found out by scientists. The giant rhino like creature, which was 22 ft long, was so formidable because it had two four foot horns sprouting from its head which could gouge even the gigantic predator. Fossil bones of an adult animal, which weighed four to five tons and stood six to seven feet tall at the shoulder and hip, were recuperated from a site in the state of Coahuila, southern Mexico, in 2003. 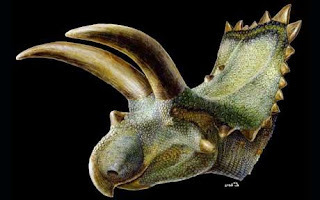 The plant-eater named Coahuilaceratops magnacuerna was an ancestor of the famous three-horned Triceratops. Like other horned dinosaurs, or ceratopsids, it had a large bony plate behind its head which would have worked as a shield. But Coahuilaceratops' most notable features are the two enormous horns that project out from above its eyes. They are the biggest horns yet uncovered. Scientists think the horns were most often used in mating or jousting contests rather than to fight off predators.